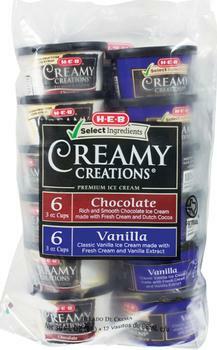 H-E-B is recalling two variety packs of Creamy Creations ice cream and sherbets in 3-oz., cups. Broken metal was found in processing equipment during routine maintenance. The product code dates can be found on the back of the packaging. Customers who purchased the recalled items should stop eating them and return them to the store where purchased for a full refund. Consumers with questions or concerns may contact H-E-B customer service at (855) 432-4438 Monday through Friday from 8 a.m. – 6 p.m. (CST).